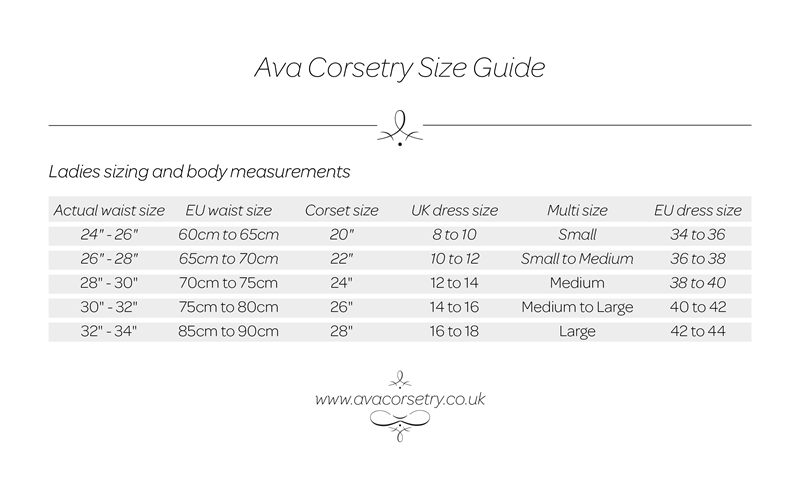 Home > Corset Upgrades > Bespoke Fit Underbust Corset Pattern - 20"-28"
Bespoke Fit Underbust Corset Pattern - 20"-28"
We can amend any standard underbust corset patterns in our core size range for a bespoke fit, tailored to your individual measurements (core size range - applies to 20-28'' waist size corsets). Just order the corset style you want in any size plus this Semi Custom package and we will contact you to discuss your requirements in detail. Should you want a bespoke fit on one of our overbust style then we recommend the Bespoke Fit Corset Pattern with Toile and Fitting - 20"-28" option, as they require a toile to ensure good fit on the bust. Bespoke Fit Corset Pattern with Toile and Fitting - 20"-28"